Set in the fictional countries of Paflagonia and Crim Tartary, The Rose and the Ring revolves around the lives and fortunes of four young royal cousins, Princesses Angelica and Rosalba, and Princes Bulbo and Giglio. Switched identities, pantomime, ballet, magic rings and roses, fairies and exciting intrigue ensue! Thackeray’s satire for children was originally published in 1855, but was adapted for the stage in the 1922 by Harris Deans, as a ballet in 1949 by composer Walter Kaufmann, and popularized in CBS Television Workshop’s dramatized version shown on February 24, 1952. 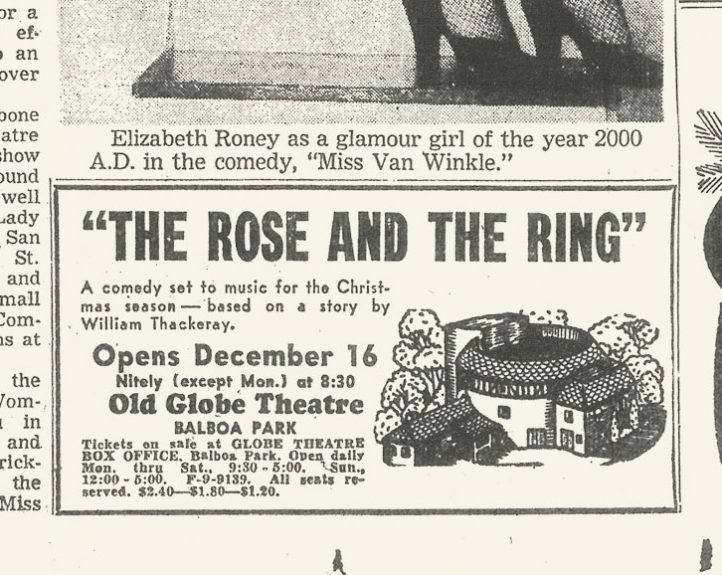 This musical production of The Rose and the Ring was part of San Diego Community Theater’s annual Christmas Festival at the Old Globe Theatre. 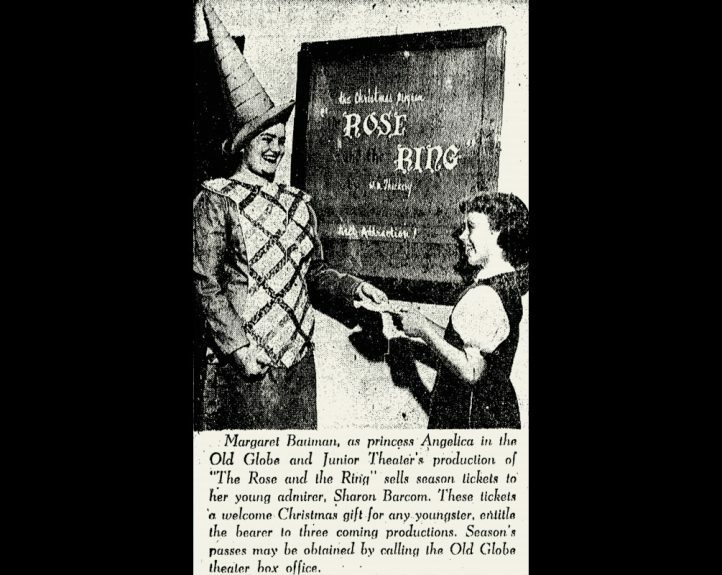 The festival ran nightly from December 16 through January 3, and included caroling on the greens, the joint production of The Rose and the Ring, and other entertainments. 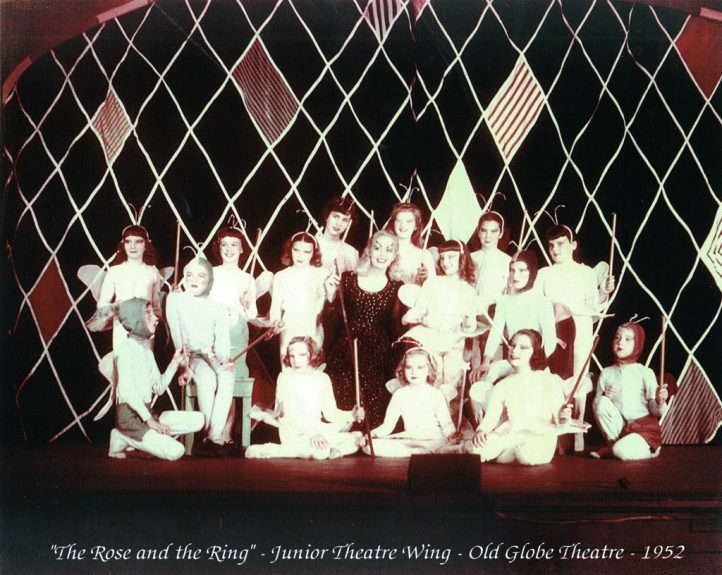 Main characters were played by adult members of the Community Theater under direction of Old Globe veteran Jackson Woolley, while 30 supporting roles were played by students from its Junior Theater Wing under the direction of Frank Crawford during four matinees. A 17-year-old Lemon Grove local, Dennis Hopper, performed alongside Junior Theatre alumna Darlene Davies. “He broke his leg before it opened,” Davies remembers, but he still “performed with a cast.” Younger actors portraying the woodcutter’s children did not have to act to look really scared. When Dennis Hopper jumped down from a table, the whole stage reverberated from the crash of his cast. The Rose and the Ring; Thackery's "Fireside Pantomime for Great and Small Children. " Adapted for the stage by Harris Deans. Music by Robert Cox. Lyrics by Desmond Carter. Based on The Rose and the Ring; or, the History of Prince Giglio and Prince Bulbo; a Fire-side Pantomine for Great and Small Children by William Makepeace Thackeray. Specially written for the Liverpool Repertory Theatre, and first produced by William Armstrong at The Playhouse, Liverpool, December 24, 1922. Produced by special arrangement with the Samuel French Company, New York, NY. Production sponsored in part by the City of San Diego Park and Recreation Department.